A Wearing History embroidery pattern. 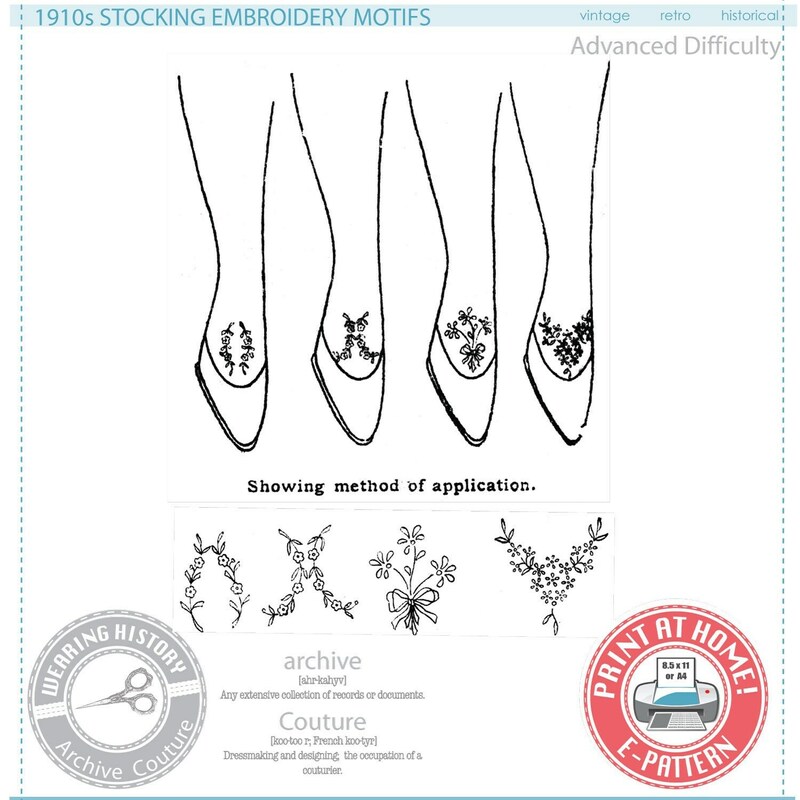 This pattern was remastered from an original 1910s embroidery transfer pattern. This pattern includes four embroidery motifs originally designed to be placed on stockings, lingerie, bags, or children's clothing. This pattern was originally on iron-on paper. This version of the pattern pattern prints on your home printer's paper and can be transferred to your fabric or clothing articles with the use of a light box or window, and a water soluble pen. This pattern *DOES NOT INCLUDE* any sort of stocking sewing pattern. You must have pre-made stockings or clothing articles to put this on. I suggest trying this on fully fashioned stockings or articles with no stretch. Trying this on stretch stockings may require some experimentation with hooping, stretch, and embroidery tension. This pattern includes the original period information, which is quite minimal, and four embroidery designs. This pattern DOES NOT include embroidery technique or instruction. Please read my shop policies prior to ordering. Thanks!